The Michael Phelps show rolls on: Is this a rerun? In case you did not hear by now, a quick glance at our "Phelps medal counter" in the upper left of the screen will tell you that Michael Phelps has kept his quest for eight medals alive by pummeling the field in the men's 200 m freestyle. Need we mention that he set another world record in doing so? He shaved nearly a second off his own previous record of 1:43.86 and finished nearly two seconds ahead of South Korea's Park Tae-Hwan in lowering the record to 1:42.96. So it was a repeat of sorts when we saw him atop the podium with an official straining to drape the gold medal over Phelps' neck. He again demonstrated his sheer dominance in the freestyle by opening up a half-body length lead after the first lap and continued to pull away from the field on each sucessive leg. Pacing to get on the podium? Phelps, in yellow clearly, swims faster than everyone else on every single leg---which is a clumsy way of saying he won the race! But what we also see is that the swimmers with the largest difference between their third and fourth 50m splits are on the podium: Phelps (0.43 s), Park (0.97 s), and Vanderkaay (0.41 s) all sped up from 150m to 200m, more than the rest of the field. A couple of the other swimmers come close, namely Biedermann (0.35 s) and Okumura (0.39 s), but in a sport where hundredths of a second determines success or failure they are, quite simply, off the pace. The other thing is that from the first 50 m they were already at least 0.2 s slower than the medalists. It is important to note, however, that the pacing strategies we see exhibted here by the medallists is not likely the cause of their medals, but rather a way to describe what is required to succeed at this level. There are many other factors that make Phelps and Park better swimmers than the rest of the pack, and the way they pace themselves is probably a consequence of those factors. So it is not as simple as just pulling aside Jean Basson, the South African who finished fourth, and telling him, "Listen, mate, all you have to do is change your pacing so you speed up in the last leg instead of slowing down and a medal will be yours!" Instead, swimmers like Basson lack the fitness, strength or other attribute(s) that gives them this ability to blitz the first 50 m and still speed up by a significant margin on the last leg. An interesting case is Park, who swam nearly one second faster on his final leg compared to his third leg. 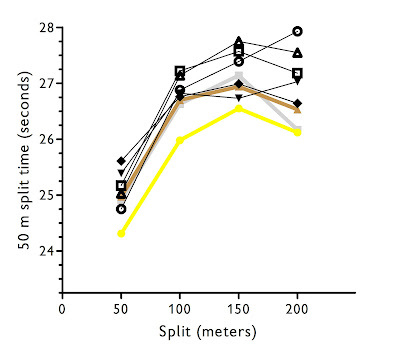 This might be a case of an athlete who could improve by 0.25 or more seconds, because to swim that much faster suggests that perhaps he could have gone a bit quicker on one of the prior legs, although this still would have put him in second behind Phelps, who was too fast out of the blocks for everyone. The best turner in the world? Something we have said before, and is being repeated by many of the announcers during the race is the superiority of Phelps at the turn. If Phelps and another swimmer are level 5m from the wall, then you can be sure that 15 m later, when they emerge, Phelps will be half a body length ahead. He makes up ground (or water?) on the turns, especially the final turn of each event, but I think it becomes a bit distorted as he likely ups his intensity, upon coming to the surface as he swims away from the others. Still, it might be interesting to analyze his turn and see exactly what his gains are. Does he have a stronger push off, i.e. does he have more knee flexor strength? Or does he execute the dolphin kick better than anyone else? Video analysis might give us some of the answers, and we will keep our eye out for anything that might provide some insight. Our focus is of course the "big picture", and the technical aspects are best left to those more expert than ourselves. One interesting blog on the more technical aspects is this one - which includes a great discussion of the pacing strategies adopted in yesterday's epic 4 x 100m Freestyle relay race between the USA and France. In winning this, his third gold of Beijing, Phelps has now joined an elite club of former Olympians as one of the most-titled athletes. The other members of this club include Paavo Nurmi, Carl Lewis, Mark Spitz, and (Soviet gymnast) Larysa Latynina, each of whom have nine golds. Of course Phelps surely will surpass all of these legends over the next few days to become the athlete with the most golds ever as he needs just one more to do so. Should he go on to claim an additional five golds, then we could see another generation go by before someone bests him. Speedo LZR racers aside, two things that Phelps and his coach have clearly nailed are his training and tapering, for there is no doubt that he is on top form right now. To arrive at a competition and win is one thing, but to set records in doing so is a clear indication that he optimized his training and got his taper just right. To be sure, he and his coach have had much experience with this over the years, but to get it right in such a big way is no small feat and cannot be overlooked! It's unfair to compare number of medals for swimmers and runners. No runner can ever compete in more than three different races, it's not like swimming where there are a dozen races of comparable distance. If they had ten different kinds of 200-meter race you would see runners with many medals too. Touche! Very true...I am embarrassed to say it, but you don't even need to look at Phelps to find this - you will find the same looking at Kirsty Coventry of Zimbabwe! She is about to win more medals than the whole of team South Africa! And while Asher, you are right that you can't compare swimmers to runners, I don't think that is really what Dean is doing - it's just an interesting observation that one guy (or girl) is able to win more than a whole nation put together (even in swimming events!). And then Miguel, thank you so much for that! Greatly appreciated! We may use that in future posts! I agree with Asher that swimming is set up to have many similar events, but I also wonder if the sport hasn't matured to the extent running has; i.e. nobody will dominate T&F like Jesse Owens did. Could Phelps be the last swimmer to dominate? Maybe not. As you mentioned, what sets Phelps apart is his underwater speed in the dolphin kick. Given that every discipline seems to have >1/4 of the distance covered underwater, I can see why Phelps can dominate so broadly. An analogy to track would be if every race was back and forth on a 100m straight stretch and runners had to "skip" along for 20m at each turn. Events would be held for running forward, backward, and sideways. No matter who was the best *runner* it's the best *skipper* who would win. Does this seem reasonable to you guys? Another way to put it, could Phelps perform as well if the pool were 400m long? "...you mentioned, what sets Phelps apart is his underwater speed in the dolphin kick. Given that every discipline seems to have >1/4 of the distance covered underwater, I can see why Phelps can dominate so broadly." You can't dolphin kick for the breast stroke - one of the reasons it is usually Phelps' slowest segment of an IM.